NJHS students line up to be inducted after receiving their membership card, pin and a congratulatory handshake from the superintendent and principal of Indian Memorial Mills School. 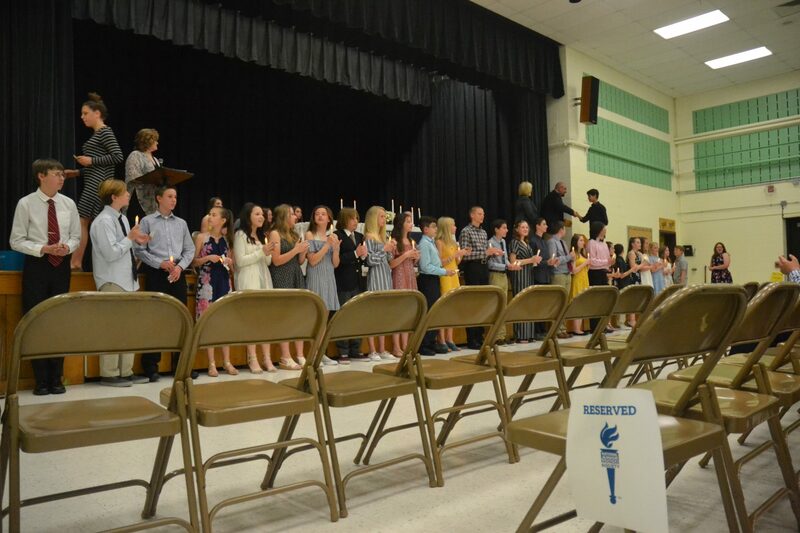 Some 31 students at Indian Mills Memorial School were inducted last week into the National Junior Honor Society for the 2019-2020 year. Proud parents, friends and family members attended the hour-long ceremony in the cafeteria of the middle school. On stage, honoring the students, were NJHS members and school faculty. “Always remember that the induction to the National Honor Society is a beginning, not an end. It is the starting point, not the finish line,” said Christine Vespe, superintendent of schools. Since the National Association of Secondary School Principals established NJHS in 1929, eight years after it founded NHS for high school students, it has grown to be the nation’s premier organization dedicated to recognizing outstanding middle level students. Today, it is estimated that more than 1 million students participate in official Honor Society activities, with chapters in all 50 states, the District of Columbia, Puerto Rico, many U.S. territories, and Canada, according to their website. Students must meet the requirements outlined by their school’s chapter to be eligible for a membership. Those requirements include a minimum GPA of 3.0, voluntary contributions, examples of leadership, character and citizenship. Each school chapter is allowed to require a higher cumulative GPA. “I’m proud of this because it shows to lots of people, especially my family, that I’ve been working hard,” said 13-year-old Caleb Graeber after the ceremony. The newly inducted students sat in their reserved seats in the front of the crowd as they heard speeches from last year’s NJHS members, the school’s principal and a guest speaker from Seneca High School. “Becoming a member of National Junior Honor Society is a prestigious feat, and it truly reflects the results of hard work, strength and character,” said Matthew Carr, NHS committeeman and Seneca High School English teacher, during his speech. When it was time for the students to receive their membership, they lined the stage’s stairs waiting for their name to be called. Students were given a membership card and a pin of the organization’s symbol, along with a handshake from the superintendent and the school’s principal. After the ceremony, students took pictures with their newly inducted members and their family as they enjoyed complimentary cake. “Working hard gives you positive energy to push on. My parents taught me to either work hard or not do it at all,” said Alex Sztagerwald, age 13, and a newly inducted member.